Hon. Jonathan Lippman, Hon. Eugene F. Pigott, Jr. '73, Dean Makau W. Mutua. Forty years to the day after he was admitted to the New York State bar, one of SUNY Buffalo Law School’s most distinguished jurists accepted the school’s highest honor. Hon. Eugene F. Pigott Jr. ’73, senior associate justice on the state Court of Appeals, was presented the Edwin F. Jaeckle Award at a New York City alumni luncheon on Jan. 31. The award, given annually “to an individual who has distinguished himself or herself and has made significant contributions to the Law School and the legal profession,” made special note of the justice’s commitment to the advancement of minority attorneys. Pigott, a native of Rochester, graduated from LeMoyne College in 1968 and then served as an Army captain in Vietnam until 1970. After graduating from the Law School, he practiced with the Buffalo firm Offermann, Fallon, Mahoney & Adner, served as Erie County attorney, then became chief trial counsel for Offermann, Cassano, Pigott & Greco. He was appointed to the state Supreme Court in 1997, elected to a full 14-year term, then was designated to the Appellate Division, Fourth Department, and appointed presiding justice in 2000. His nomination to the Court of Appeals, New York’s highest court, was confirmed by the State Senate in 2006. At the luncheon, following welcoming remarks by master of ceremonies Thomas E. Black Jr. ’79 and Law Alumni Association President Terrence M. Gilbride ’88, the honoree’s boss – New York State’s chief justice, Jonathan Lippman – paid tribute to Pigott’s role on the high court. Dean Makau W. Mutua reported to the attendees that the Law School is “in good health,” pointing to progress in faculty hiring, building renovations and the academic quality of the student body. Noting that applications to law schools nationwide have dropped by nearly half, the dean said legal education will almost certainly undergo changes. He announced that the University has given its assent to reducing the Law School’s enrollment to 600, down from the current 750. 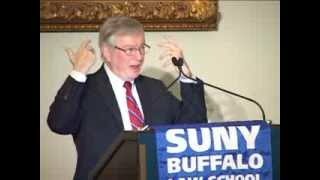 The dean also shared the happy news that the Campaign for SUNY Buffalo Law School has raised $22 million toward its $30 million goal. Especially, Letro said, Pigott has worked tirelessly “for the benefit of the profession and its day-to-day practitioners. While his job is to be the last word on the Court of Appeals when it comes to application of the law to the specific facts of a case, he also sees his job as being the first word when it comes to advising and counseling lawyers on how to build a successful and fulfilling and helpful legal career. He frequently reminds us to take seriously our obligations to our clients and to the court, but not to take ourselves too seriously. Most of all, he reminds us to balance our professional obligations with the needs of one’s family and oneself. Mutua noted that Pigott loves lawyers and the law, and “possesses a wonderful humanity. He gets the fact that the law is about people.” He also praised Pigott’s service to the Law School as a guest lecturer and mentor and as a longtime member of the Dean’s Advisory Council. In accepting the Jaeckle Award, Pigott noted how difficult the job of attorney can be. “If doctors were like lawyers, that would mean if they’re there to take out your appendix, there’s a doctor on the other side of the table trying to keep it in,” he said. “It’s a tough business, and the fact that we can keep our civility and our fraternity is amazing. What we do for people is incredible. Watch a Video of the entire event.